COLLEGE PARK, Maryland, May 19, 2015 (ENS) – Weather forecasting centers around the world have now declared that an El Niño, the most powerful fluctuation in Earth’s climate system, has begun in the tropical Pacific. 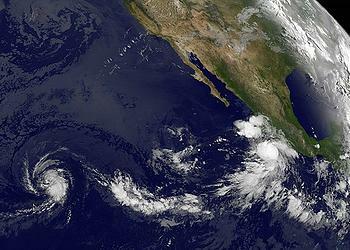 El Niño is a warming of the Pacific Ocean as part of a complex cycle linking atmosphere and ocean. An El Niño can raise global temperatures, says the UK’s Met Office. A El Niño event brings a higher risk of more, and more severe, tropical cyclones. Impacts on the biosphere are expected, such as coral bleaching and widespread movements of marine life. There is a 90 percent chance that this El Niño will continue through the Northern Hemisphere summer 2015, and a greater than 80 percent chance it will last until year’s end, the U.S. National Weather Service and the International Research Institute for Climate and Society predicted Thursday. In an El Niño event, surface waters in the central and eastern Pacific become much warmer than average, influencing weather patterns and affecting fisheries along the west coasts of North and South America. The El Niño pattern begins when easterly trade winds in the Pacific falter and allow giant waves of warm water to drift from the western Pacific toward the Americas. The United States’s Climate Prediction Center, operated by the National Oceanic and Atmospheric Administration, has observed sea surface temperatures about 0.6°Celsius above average in the central, equatorial Pacific, one of the key indicators of El Niño. El Niño can be linked with poor monsoon rains in Southeast Asia, droughts in southern Australia, the Philippines and Ecuador, blizzards in the United States, heatwaves in Brazil and extreme flooding in Mexico. Long-lasting severe drought conditions over Micronesia, Melanesia and parts of Polynesia are likely, forecasters warn. Rainfall deviations from average could be extreme. In Papua New Guinea below normal rainfall is expected in parts of the southern region before extending to the highlands during the second half of this year. Scientists have been watching closely because an El Niño can change the odds of floods, droughts, heat waves and cold seasons for different regions around the world. But now observations from the tropical Pacific show weak El Niño conditions for the first time in five years. While it is still too early to determine with confidence how strong this El Niño might be forecast models from centers around the world, including the UK’s Met Office, suggest this El Niño could strengthen from September onwards and persist until early 2016, potentially exceeding impacts of the major El Niño in 1997/98.